"No... No... stay where you are. Do not break the stillness of this moment. moves forward swiftly, silently.... This is -- The Haunting Hour!" This old time radio show was billed as "Mystery at its Best" solves psychological mysterie, "whodunit" thrillers and crime crusades with a cast of network stars. The Haunting Hour is a very mysterious show. First, let's note that the Haunting Half-Hour would actually be correct, but an odd title for the show. So Haunting Hour it was. The second mystery is that, like so many of the great radio talents who labored in the background, unseen and unheralded, this show made for transcription has receded into the ethers of old time radio without a history. That is, the Magister Ludi of Old Time Radio himself, John Dunning, succinctly states in "On the Air, The Encyclopedia of Old Time Radio,""There were no credits, so casts and production crews are unknown." Vanished without a trace? Were they really there, making real radio? The answer is yes, and the following set of shows proves it. Perhaps you, the kind listeners, might give us a clue to the talents involved. Or were we all just imagining it? It sounds like a plot for another Haunting Hour. The shows are classic chills from the old school, with creepy organ, overwrought women and over the top men. Perhaps not the highest of melodrama, but obsessively workmanlike. After all, they might have known they were a skeleton staff toiling relentlessly without a ghost of a chance of fame. Thanks to transcription, these unknowns are still with us. The great comedy varieties where huge money-makers for the networks during the Golden Age of Radio. Music programs of all sorts were a natural source of programming. Kids would hurry to finish their homework, so they would not miss their favorite after-school children's shows, taking over the radio from Mom who spent most of the afternoon crying over her Soaps while doing her housework. Escapist adventure dramas and hard-boiled detectives helped Dad to unwind after a hard day at work, while educational and news programming gave the commercial networks the appearance of serving the public interest. This resulted in a huge variety of programming, and because it was commercial, in general, it was very well done. However, what radio did best, perhaps better than any other medium including cinema, was Horror. All forms of drama depend on the "willing suspension of disbelief" to a greater or lesser extent. Radio facilitates this suspension even better than cinema and the images formed in the listener's mind have an even greater chance to expand and intensify, especially when said listener is in a dark bedroom with the sheets pulled tightly over their head! One of the better-produced horror/thriller programs was NBC's The Haunting Hour. Never mind that The Haunting Hour was really just a "Haunting 30-minutes", the show had some of the highest production values possible during the mid- to late-Forties. 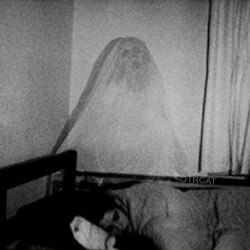 Usually, this level of quality would only be possible with a big-budget sponsor, but The Haunting Hour was produced for the speculative network syndication market. The business model for most programs in the Golden Age was for a single sponsor to be responsible for a show. The network would provide more or less production assistance, but essentially what they sold to the sponsor was air time. The networks mandated live broadcasts, not so much because live is better, in fact, live broadcast presents all sorts of predictable but usually unavoidable problems. The producers of Amos 'n' Andy tried to deal with these problems with a pre-recording scheme as early as the Twenties, but recording and replay technology were so unreliable during the early years of OTR that the problems of live broadcasting were more than worth dealing with. Seeing the success ZIV Syndications had with The Weird Circle from 1943, NBC directed their Radio Recording Division to come up with something similar. The NBCRRD began as an in-house network service to record live network programming for internal use. When the network began to realize that their local affiliates had a need for content beyond the premium network fare, the Division began producing short programs on disc which affiliates could sell to local and regional sponsors. By 1945, the Division touted itself as "America's No. 1 source of recorded programs." 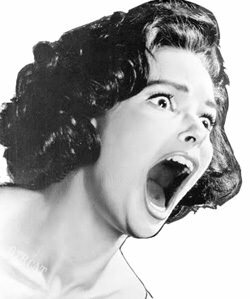 Like CBS Radio Mystery Theater would during the Seventies, The Haunting Hour did not limit itself to a narrow definition of horror and explored a wide range of themes. Since they were part of the network, the producers had no trouble hiring the most talented Radio Row players to act on the program. One casualty of syndication, however, was acting credits. The script of a live network program had the announcer reading the cast and production credits near the end of the broadcast, but the syndicated discs would be shipped with production notes for the local announcer to read along with local sponsor messages. Since the sponsor messages were paying the bills, cast credit was often ignored. Veteran Suspense announcer Berry Kroeger was tapped with announcing duties for most of the episodes. Bret Morrison also appeared in multiple episodes. Rosa Rio's organ playing talents helped to set the mood. 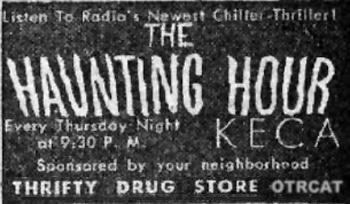 According to Variety Magazine, in 1947 there were 99 stations carrying The Haunting Hour. At $150 (reduced to $100) per episode in larger markets, it was a highly profitable show for NBC. See also the some of the classics of thrills and horror: Suspense, Inner Sanctum, Lights Out, Mysterious Traveler, The Whistler, Witch's Tale, Escape and I Love a Mystery. Also recommended are the Dark Fantasy, Mystery in the Air, Hall of Fantasy, Unexpected, Weird Circle, Strange Dr. Weird, and the many detectives and operatives whose lives are littered with clues and corpses. strangest fascination, charging the mind with doubts and fears. For mystery is a strange companion, a living memory in The Haunting Hour." I am in love with Old Time Radio shows. I'm 25 years old, but am obsessed with the magic radio brings!